Custom Wavefront LASIK surgery is considered a very safe LASIK procedure and takes advantage of the latest laser vision technology and uses 3-dimensional measurements of the eye to enhance the lasers ability to re-shape the front surface of the eye (cornea). This allows for precise, individualized vision correction outcomes to be achieved that are not able to be achieved with Traditional LASIK surgery. With Custom Wavefront LASIK, your eye's ability to focus light rays is measured from front to back, and a 3-D map is created that demonstrates irregularities in the way your eye processes images. Information contained in the map guides the laser in customizing the treatment to reshape your eye's corneal surface so that these irregularities can be corrected. Adapted from technology that allows land-based telescopes to produce images comparable to those generated by the Hubble Space Telescope, Wavefront LASIK consists of a sensor and a laser. All of these visual irregularities are then displayed as a 3-D map, referred to as a WaveFront map. This information is then electronically transferred to the laser (in Wavefront-guided systems), and computer-matched to the eye's position, enabling the surgeon to customize the Wavefront LASIK procedure to your unique visual requirements. A wave of light from a laser beam is sent through the eye to the retina. This light is reflected back through the vitreous, the lens and the pupil. The sensor measures the irregularities at the front of the wave of light as it emerges from the eye. This produces a precise three-dimensional map of the eye's visual system, including the cornea's imperfections or aberrations. Are Custom Wavefront LASIK Outcomes Different? Wavefront LASIK technology is groundbreaking because it has the potential to improve not only how much you can see, visual acuity measured by the standard 20/20 eye chart, but also how well you can see, in terms of contrast sensitivity and fine detail. This translates into a reduced risk of post-LASIK complications, such as glare, halos, and difficulty with night vision. How much you see depends on vision defects known as lower-order aberrations associated with common refractive errors including myopia, hyperopia, and astigmatism, which traditional LASIK can treat. How well you see can depend on the presence of and type and number of visual distortions also known as higher-order aberrations. These aberrations may include irregularities other than common refractive errors. These higher-order aberrations can create problems such as decreased contrast sensitivity or night vision, glare, shadows, and halos. However, higher-order aberrations do not always affect vision. Unlike traditional LASIK, Custom Wavefront LASIK treats both lower- and higher-order aberrations. Studies have shown that the visual results with Custom Wavefront LASIK are more predictable than with Traditional LASIK. Studies comparing results of Wavefront LASIK with conventional LASIK found that 90 to 94 percent of patients receiving Wavefront LASIK achieved visual acuity of 20/20 or better, whereas over 80 percent of those receiving conventional LASIK achieved 20/20 or better. In August 2004 the U.S. Navy announced that patients at its refractive surgery center were achieving better distance vision and night vision after custom LASIK than after traditional LASIK. Wavefront LASIK may not be for everyone. Because wavefront LASIK removes more corneal tissue than conventional LASIK, patients with thin corneas may not be good candidates. Also there is a limit to the degree of correction that can be achieved by the wavefront software. So some patients with higher degrees of myopia, hyperopia, and astigmatism may not be candidates for custom LASIK. However, these patients may still be good candidates for the conventional LASIK procedure. 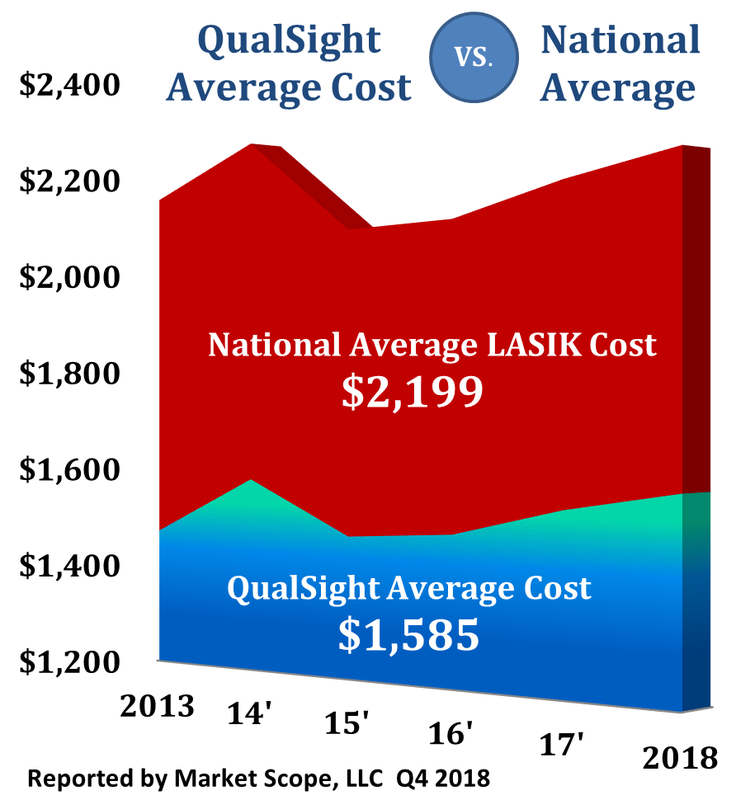 The custom LASIK eye surgery cost is a modest amount more than the tradition LASIK laser eye surgery cost.